I've attempted to piece together an order from Kvernmo's disparate works, but it's fairly difficult outside of using the slots the maps occupy as a reference, which when you throw the Master Levels in becomes a bit confusing (not the least because Bloodsea Keep, which occupies the MAP07 slot along with Mephisto's Maosoleum, appears to be the first map in the story). Further confounding the issue, some of the Cabal maps have no story to even approach the question of where they occur on the timeline, like The Watchtower or Temple of Death. Additionally, none of the maps have any consistent aesthetic theme, further distancing their relationships. I suppose I could always ask him - he does appear on Doomworld on occasion. The basic story: The player character was the Cyberdemon ruler of Hell and part of an organization of demons known as the Cabal. The ancient evils betray you, however, transmogrifying you into a human and casting you into a sea of blood. Your adventure is thus a tale of revenge as you strike back at your former peers, penetrating to the very depths of Hell and slaying their new fortunate son as well as all the Cabal members you meet along the way. Some battles are more tactical, like Derelict Station, while others represent traps laid by your enemies, as in The Express Elevator to Hell. Only four of the ruling elite are mentioned by name in the .TXTs; doubtless the author had more in mind if he intended to fill out thirty-two maps. Kvernmo's Cabal maps appear to bounce between shorter, deathmatch-oriented maps or larger, epic adventures through incredibly deadly locales, either due to devious monster placement or dastardly death traps. The commercial releases have a lot more polish in encounters and aesthetics, though anyone who's played TEETH or Black Tower can tell you that they're not that much easier...if at all. The deathmatch maps, some produced in tandem with Greg "Acoma" Hyne, have telltale elements in their weapon and powerup placement that Kvernmo cleverly adapts to single-player challenges. He is also willing to challenge the player with puzzles. They're less obscure than some but thick enough in levels like Black Tower and The Image of Evil that proponents of more traditional action will encounter some difficulty. You're cast out of Hell - well, I guess the inner regions of Hell - and into an enormous sea of blood. When you drag yourself onto the pier of an isolated castle, you realize that it's home to one of the members of the Cabal, the arch-vile Veavitdpoh. How convenient for you. 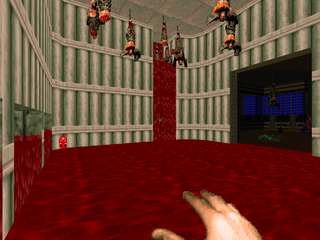 Bloodsea Keep is one of id's Master Levels, and probably the most accessible of his entire output, having relatively simple combat. It also looks very nice, with its marble courtyard and hallways and neat siderooms like the expansive library, where the lord no doubt keeps his ancient tomes. It's also got plenty of secrets for inquisitive players, though a few I wouldn't bother to look for without some protection. BLOODSEA is definitely a must play. After the home of (ex-)council member Veavitdpoh, you leave the sea of blood, perhaps via some fiendish magic courtesy of his extensive library. Your first stop is a ruined outpost of Hell's forces near the shores where you restock your supplies, preparing for your assault, only it's not as abandoned as you'd hoped. Derelict Station is one of Kvernmo's smaller maps and is a mostly gray and silver outing that features his imaginative lighting. it's still a tough map, featuring claustrophobic action and plenty of ambushes that will have you ducking for cover. There's also some nice detailing, especially in the damaged section, which incidentally houses one of the niftier secrets. Once you've dispatched the incumbents in the outpost, you head inland where you find a station where the forces of Hell store blood for transport, an important element in their Satanic rituals and magics. You resolve to destroy the tanks, spoiling their resource and striking a blow against the forces of evil. 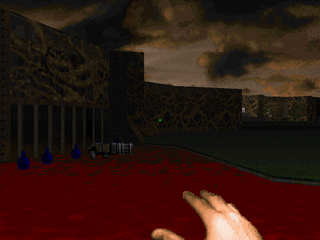 Bloodflood is another small Kvernmo map, but it's very notable for a special effect that occurs once you've completed your objective, a very nice touch that helps to give the level some much-needed flair. It's otherwise full of deadly surprises, with hitscanners often getting the drop on you, and DM-oriented obstacles that he's co-opted for devious single-player traps. I love the fight when you jump into the blood pit. Following your successful sabotage of Hell's vital blood tanks, you continue to head inland, only to come across another fortification of the infernal army - an enormous watchtower. Perhaps you've been spotted, and need to silence its occupants before they can reveal your presence. Regardless, you set about to cleaning house. 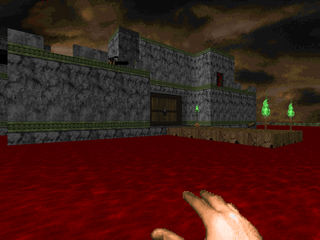 The Watchtower is another map that, like Bloodflood, has numerous features obviously intended for deathmatch players. It's also got a fairly confusing layout that, while simple, may lead you to provoking the wrong battles before you're adequately equipped. I like many of the features, particularly the darkened hide-and-seek room which has some masterful lighting. It's very much one of Kvernmo's rougher maps, though. 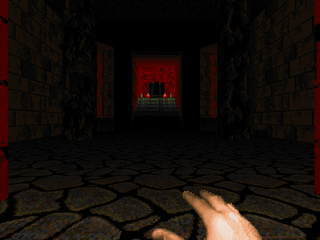 After conquering Hell's watchtower, you head in further, approaching the Temple of Death. Its exact importance to the infernal armies isn't explicitly mentioned. Granted, they're demons that revel in the slaughtering of mortals, which places the souls of the wicked in their domain. Perhaps the desecration of the Temple serves as a demoralizing strike. 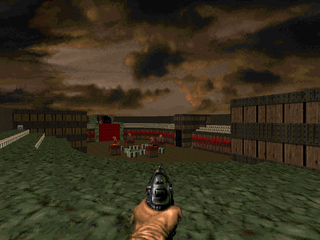 TODEATH is Kvernmo's earliest work, and the roughest, both visually and in terms of difficulty. 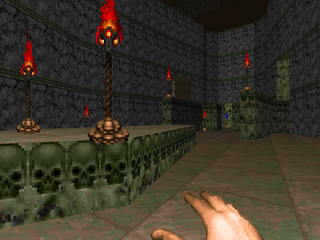 The Temple is enormous and filled with all kinds of nasty traps and several large pitched battles that require no small amount of effort to combat. Some of them are ingenious, like a column that looks like solid cover at first, but won't hold out. If you enter the Temple of Death, expect to die a lot. You've annihilated the congregation at the Temple of Hell and plunge through a portal deep inside, hoping to find an easy avenue toward another of the Cabal members. Unfortunately, it leads directly to a blood-stained arena where the demons play the ultimate game of afterlife or death. 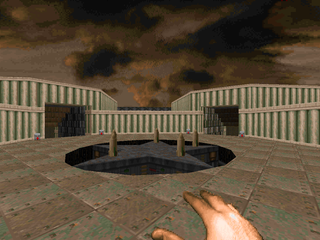 We Who are About to Die is a very compact map; most of the major action takes place in the arena itself in a series of battles between the exploration of the holding cells that house future combatants. 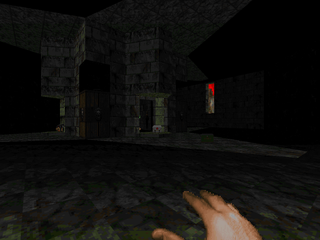 Combat is either frantic shootouts against enemy hordes or handling claustrophobic traps that leave you reeling. 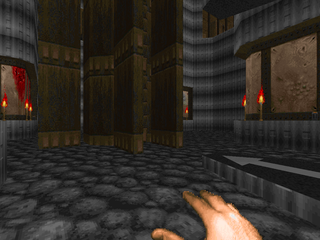 The level itself isn't much to look at, but it has a few neat set pieces, like the demonic emperor's throne or the exit teleporter. Plunging through the teleporter at the end of the ARENA, you make your way to the quickest way to the very bowels of Hell and the rest of the Cabal - The Express Elevator to Hell. Unfortunately, partway down, the elevator stops and an ambush roils out. Looks like the Cabal realized their mistake. TEETH is one of Kvernmo's hardest maps, an enormous elevator shaft with eight separate floors. You're immediately thrust into a battle for survival which hardly lets up as you explore. You'll want to find every secret to have a fighting chance in the incredibly close quarters. The design is very intricate, with many floors containing passages to others besides the main chamber. TEETH has a secret level attached - "Bad Dream" - which is a very simple challenge that's worth playing at least once. You enter the hidden exit off the elevator shaft and after a long walk emerge at the heart of the ruined cacodemon empire, which collapsed almost 666 years ago. That's some really unfortunate timing on your part. 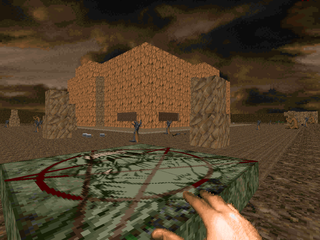 Eye of the Storm is a very simple, mostly outdoor map based around the central area - a circular yard surrounding a monolithic structure, with a number of chambers surrounding it that will gradually open up to exploration as you clear the level. Combat is difficult, but it's all leading up to one fight in particular - the rebirth of the cacodemon empire. It's an explosive, oppressive moment that seems like it will never stop. You'll want to use your armaments wisely and situational awareness is paramount when you're under assault from every side. So, you were fortunate enough to survive the cacodemon onslaught in the ruins of their empire. Strolling across Hell's topography, you come across a familiar site - the mausoleum of Mephisto, who led the assault on Earth and was ousted as head of the Cabal following his failure. His spirit maintained a seat, though, making him another betrayer and a target for your wrath. Mephisto's Maosoleum is a unique map, featuring some neat story elements and a low monster count which is nonetheless potent through Kvernmo's layout and use of opponents. You'll get to raise Mephy's broken body in its tiny crypt, thus awakening the spirit (a boss-shooter) in the enormous, adjacent building. Some clever use of the 666 and 667 tags makes for atypical progression elements. 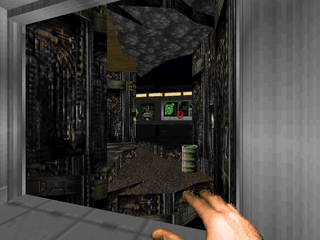 Toward the end of your long journey smiting the members of the Cabal, you come across the Black Tower inhabited by the Cyberdemon, Chagrin. He was a brother and a friend - now he's the commander of the armies of Hell and must be put down like all the others. 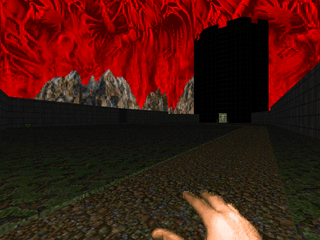 Black Tower is perhaps Kvernmo's greatest entry in the Cabal series, a massive map using teleports to simulate an enormous, six-floor building chock full of monsters. The emphasis on dark magic means some very nasty fights, like an encounter with barons and demons fraught with teleporting linedefs, or the very memorable climax at the tower's apex, after which you'll have to fight your way back down through even more enemies. If you should play any one map of the Cabal series, make it this one. It's been a long road, but you're finally at the end. The last living Cabal member is the Cyberdemon ruler of Hell, who sits in a temple erected in honor of the first demon to slay an angel, Lithlaar. You'll have to battle through a contingent of demons including his two soulguards before you can complete your revenge. The Image of Evil is a fitting finale to the Cabal series with an impressive secret rendered in its geometry. You'll experience a wide variety of locales and fights on your way to the final fight, including a dangerously congested battle through an infernal brain. Expect to weather Kvernmo's fiendish traps and be on the lookout for secrets - you'll need every edge you can get. THE_EVIL is probably my favorite of Kvernmo's non-Master Levels.